During their stay, campers sleep on beds inside tents mounted on wooden platforms. There are separate sections for girls and boys. The Camp is located on the shore of Lake Didi, and youngsters can enjoy sports like swimming, canoeing, kayaking, pedal-boating and paddleboarding, or simply “chill out” with friends on the sandy beach. Trained and supervised, the activities team makes sure that all campers have a memorable time in a safe environment. Most of the counsellors are former campers themselves, and their commitment, vitality and personal involvement ensure that by the time youngsters head home, they have absorbed tangible examples of how Camp personnel live full, happy lives with diabetes. Onsite buildings include Ross Hall, a spacious dining room with a modern kitchen, McGarry Chalet, for indoor games, arts and crafts, singing, dance and theatre, and the Belmonte Infirmary, which has all of the necessary equipment. The activities program is wide ranging, and there are dedicated areas for archery, badminton, volleyball, basketball, tennis, football, and camping and forest survival skills. Older groups can take part in bike outings and canoe-camping trips. Youngsters’ health is the top priority for Camp Carowanis staff. In the Belmonte Infirmary, medical and nursing personnel provide campers with around-the-clock medical care adapted to diabetes. Campers test their own blood-sugar levels at least four times a day under supervision and learn how to administer insulin injections on rotating sites. The onsite doctors and nurses also teach them how to recognize the symptoms of and treat hypoglycaemia, and how to adjust their insulin doses if necessary. A suitable diet based on real understanding of diabetes is one of the keys to controlling the disease. Working with doctors, a team of nutrition students adjusts individual diet plans and teaches campers how to calculate the nutritional value of various foods in accordance with their diet. At mealtime, a nutrition student checks the contents of each plate and helps individual campers learn about food. Each day, the Camp’s team of doctors, nurses and nutritionists supervises the use of dozens of insulin pumps, administration of over 400 insulin injections and measurement of 700 blood glucose levels, as well as manages three meals and three snacks! 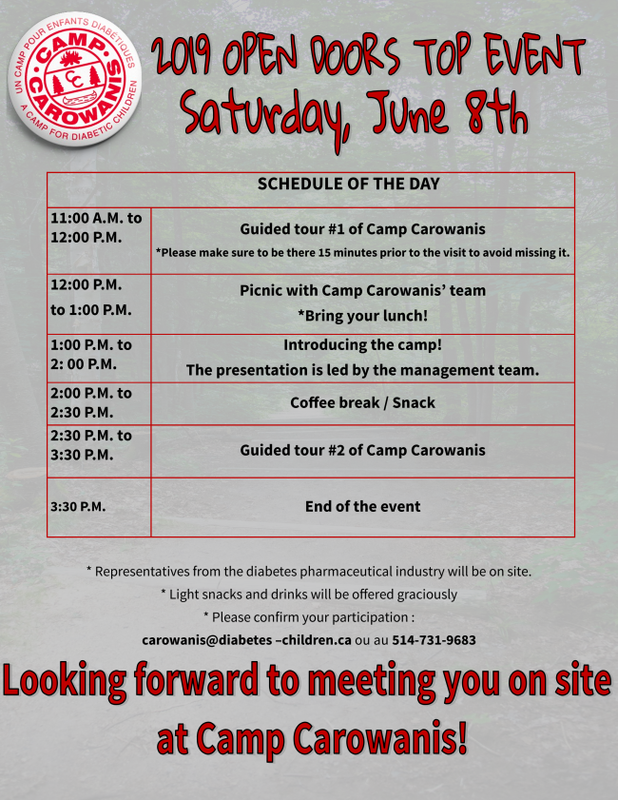 On Saturday, June 8, 2019, Camp Carowanis will be holding an open house day. Two guided tours are scheduled in addition to a presentation of the place. The whole family is welcome. Don’t forget to bring your lunch and sunscreen! This is a unique opportunity for you to explore the site on the shore of Lake Didi, in the heart of the Laurentians, and meet Camp personnel, including director Janie Lépine-Bédard, head nurse Andréane Vanasse and our dynamic team of camp counsellors. Come experience the magic and power of this place that has changed the lives of so many diabetic youngsters for almost 60 years. You can ask our staff questions, and your children can meet their counsellors and other future campers. A not-to-be-missed opportunity! Aimed at diabetic children under 8 years of age and their entire families, with each family housed in a separate tent, this very special weekend is usually held in mid-August. Parents have access to advice and counselling from a team of multidisciplinary health professionals during informal workshops and information sessions, while children take advantage of the Camp Carowanis facilities and discover the magnificent site under the supervision of a team of qualified counsellors. The 2019 edition of this highly popular weekend will be held on August 16, 17 and 18.